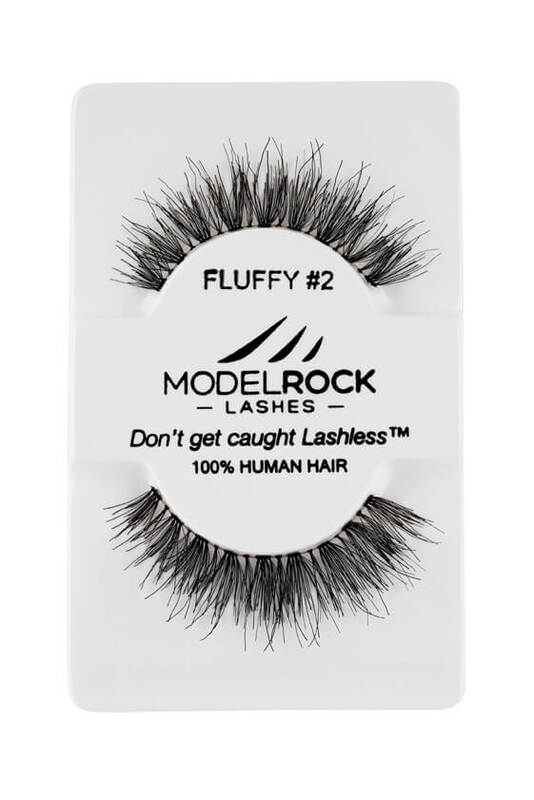 MODELROCK Kit Ready Lashes - Fluffy Collection #2. 1) Start with a clean, dry eye area. Curl your natural eyelashes with a lash curler as needed. 2) Take one lash from lash tray. Hold it up to your eyelid to approximate to make sure it fits your eye. If the lash band is too long, trim from the shorter inner end. 3) Apply a very thin line of strip glue directly onto the lash band. 4) Let the glue dry for about 20 to 30 seconds. The desired glue consistency should be moderately dry (tacky). 5) Apply by getting as close as possible to your lash line and gently press the lash band from the inner corner out to the outer corner of your eye. You can use the end of a thin makeup brush to scoot it closer before the glue sets. The goal is to leave as little space between the lash strip and your lash line for the most natural look. 6) Let it dry with that eye closed for about a minute so any excess glue doesn't travel up to your lid. If it does, remove it with a little makeup remover on a Q-tip. 7) Repeat this process on the other eye. 8) Let both dry a few minutes, then proceed with liner, shadow (if desired), and one or two coats of mascara to blend in your falsies with your natural lashes for the perfect lash heads turn look!